BEIJING — The NHL will play its first games in China this fall when the Los Angeles Kings and Vancouver Canucks meet in Beijing and Shanghai. The preseason games will take place Sept. 21 in Shanghai and Sept. 23 in Beijing. Commissioner Gary Bettman announced the launch of the NHL China Games at a news conference Thursday morning at Le Sports Center. China is expected to be a large focus of the league's international ventures. Next season, the NHL is playing two regular-season games in Sweden between the Colorado Avalanche and Ottawa Senators. Bettman called it a historic moment for the league and said the NHL's commitment to China goes beyond the 2022 Winter Olympics in Beijing. He and other league officials have said it's a long-term arrangement with China that also includes contributions to growing grassroots hockey in the country. "While we fully understand the priority the government has placed on high-level performance by the sports teams representing China at the 2022 Olympic Winter Games here in Beijing, our commitment to the growth of hockey in China involves partnerships that will extend well beyond the few weeks of the 2022 Olympic Winter Games themselves," Bettman said. "This is the beginning of what we believe will be a very long-term relationship, and the two NHL clubs participating in this inaugural effort are perfectly suited for their roles." NHL Players' Association special assistant to the executive director Mathieu Schneider said players have reached out to him to express interest in going to China and helping teach the game there. The Canucks, Kings, Boston Bruins, Montreal Canadiens, New York Islanders, Toronto Maple Leafs and Washington Capitals have already conducted camps for young Chinese players. 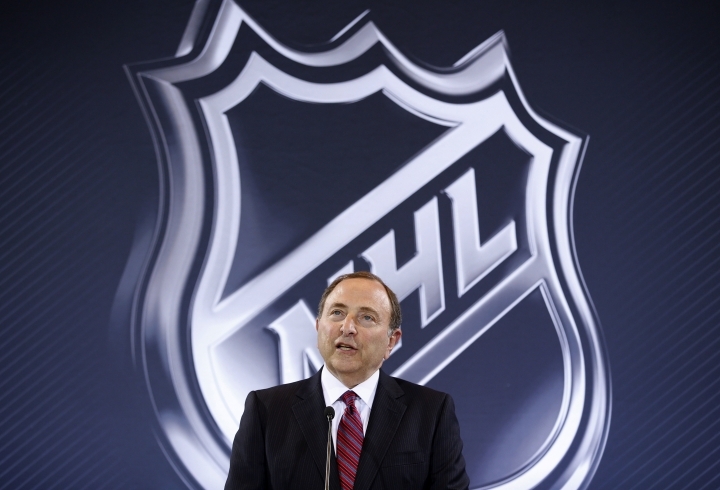 "Right here in China, the NHLPA and the NHL have an amazing opportunity to grow the game of hockey," Schneider said. "It is clear from our meetings with various officials in China that they share the same passion to grow the game of hockey as we do." The NHL has not committed to sending players to the 2018 Olympics in neighboring Pyeongchang, South Korea. International Ice Hockey Federation president Rene Fasel has said the NHL can't pick and choose which Olympics to go to and that discussions about Beijing can wait until the situation in South Korea is settled. China is a focus for the league with help from the Chinese government and the private sector, led by Zhou Yunjie, the goaltender-turned-billionaire chairman of metal can manufacturing company ORG Packaging. "We'll play our best part in unlocking the potential of ice hockey and pushing on the arrival of the golden era of ice hockey in China, thus realizing the vision of 300 million people on ice as reality and making China a new and uprising ice hockey power," Zhou said.